Most members will know www.art-of.trading, an open website I run with the purpose of easy plotting RV charts. Now I have some bad news to convey. But there is some good news also. I will discontinue www.art-of.trading. After running it and offering its content for free for more than a year now I will not maintain the webservice longer in its current form. Daily updates will continue for now but the site will not be accessible anymore within some short period of time. There will be a replacement - a good one. Taking the essence of numerous discussions here on Steady Options and my personal take-aways and learnings from running art-of.trading I am up to offer an entirely new service for providing tools for trading the Steady Options way (in the same breath I should add a big thank you for all remarks and positive feedback I have gotten over the entire period. That is what made me take that route. On top I see that Steady Options continues to be a unique community on the web for trading options, with very good people and quality content - reason enough to stick around). Currently the site is working but open only to beta testers and not 'officially' released yet. Am still looking for some more beta testers. If you want to have early access I invite you to PM me for a free invitation code. Beta testers will get free access for some time once the site launches officially. 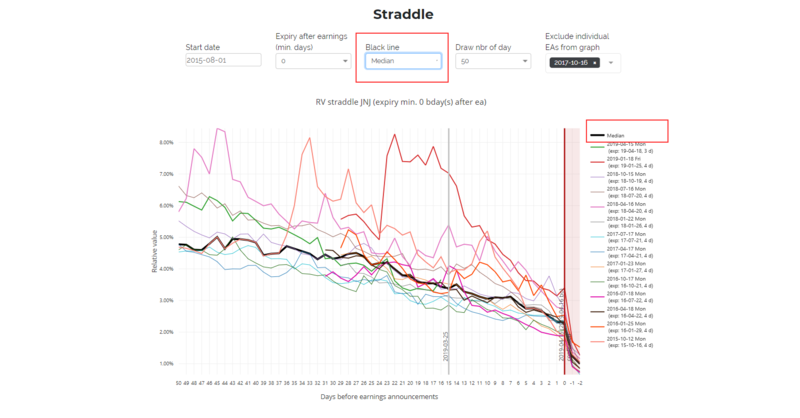 You will find much more tables and graphs for each symbol with all information needed for trading the SO way: Historical implied move vs. actual move (as graphs and tables), credit needed for hedging straddle decay, actual performance of straddles around earnings. But also basic stuff like the next dividend ex-date or how long before the actual earnings announcement the announcement date gets confirmed (more details on specific features in later posts). 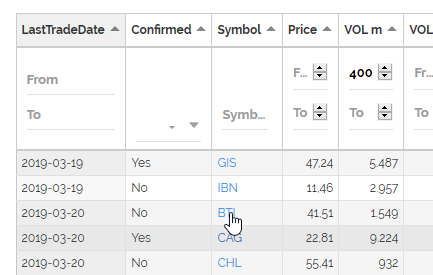 Also, you will find practically any symbol now which comes at least with some traded options volume. Having all information in one place elminates the need to jump back and forth between different pages and websites, having to reenter the same symbol again and again (which I understood is an issue). A side bar allows for easy and fast navigation up and down on the page. All features came out of discussions and from my own experiences while trading. I believe they will be helpful. I will introduce some in greater detail in a couple of follow-up posts in this thread. On top of that there are a couple more pages to be added to this site. They are in planning and partly already in implementation. They will be added in the course of the next weeks/months. 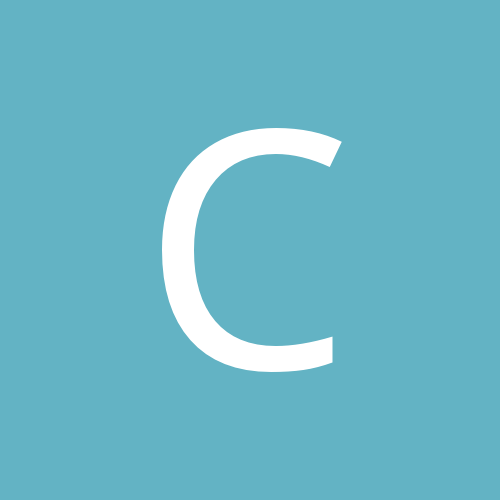 Chartaffair will be a paid service after the beta phase (it is not possible elsewise. But it will be worth it.) 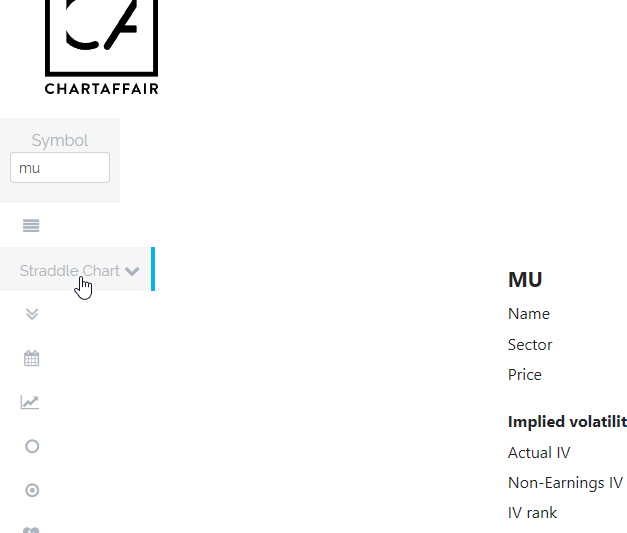 Now, if you found art-of.trading helpful over the course of last year, I invite you to sign up to chartaffair.com when the beta phase is completed. You will find it even more helpful. 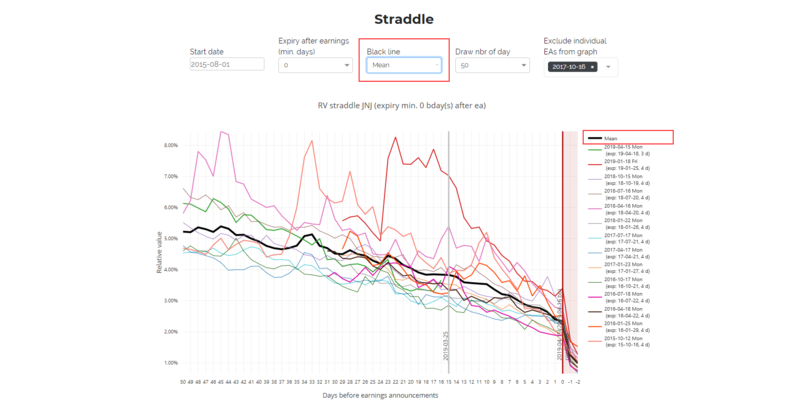 The symbols on the earnings chart page are links - a click opens the symbol's details. @Christof+, sad to hear you decided to discontinue www.art-of.trading - it is really good free service for evaluating SO strategies. But it is nice to hear you finally ready to provide a professional paid service! 0% - 14% VIX -> 1 pt. 14% - 23% VIX -> 2 pt. 23% - 30% VIX -> 3 pt. Possibly other values make more sense. Let me know - it can be changed easily. Line thickness can easily be overlooked if you are not aware of it (thanks @ales19 for pointing it out). In the Historical Earnings Announcement section I have added a bar chart to compare the implied against the actual earnings move (intraday in lighter color, and at day end in stronger color graphically, and for a longer history in a table). The blue dots represent VIX values, should help to see in one glance how the overall market IV may have influenced the implied move. 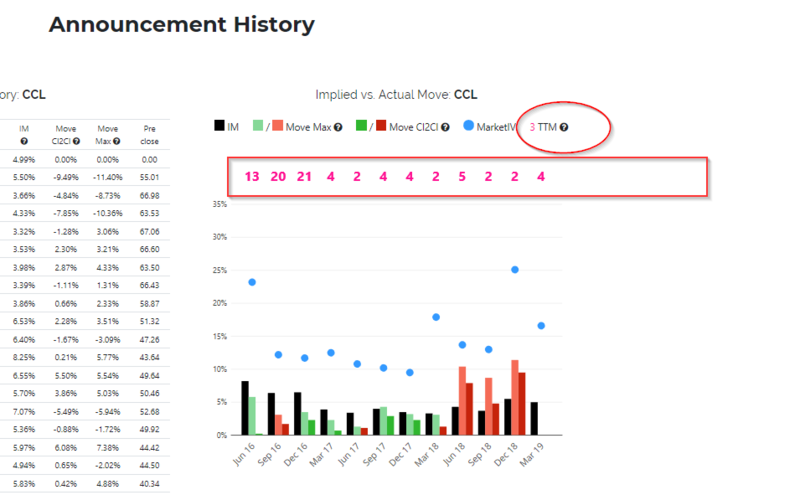 The pink numbers represent the remaining life of the options used to calculate the implied move at the time of the earnings announcement (TTM = time to maturity. If the TTM is further out, the implied move (IM) might be inflated). 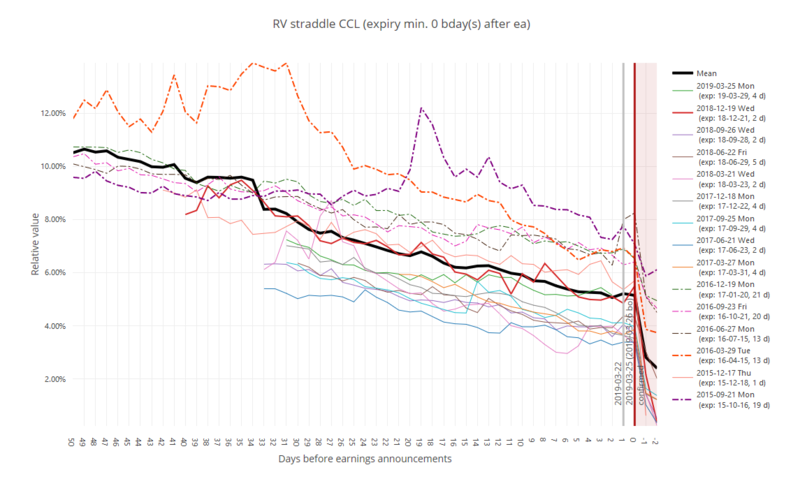 So in the CCL example, you see in the top table that weekly options started trading in February 2017, which corresponds with the longer TTM values prior to 2017-03 in the chart above. The pink numbers have caused some confusion, and I agree one needs to get used to it. I tried to add a '?' with tooltips everywhere. But if you still have a better idea please let me know. When I export to CSV or Excel from upcoming earnings page, it dumps European number formats which my Excel doesn't process correctly ... is there a way to choose American number formatting? @trader212 Thanks for the hint. I changed the number format to US (which is probably more consistent anyway). Should work when you try next time. As before all columns can be filtered and sorted. This can help you for example when looking at sorted average straddle decay numbers when looking for candidates. Hello @Christof+. The new site is great. Would it be possible to show the last dividend paid as well as the date it was paid and the dividend frequency? Thanks in advance. @poseidolginko Thanks ! I get the idea (and even already own this data). Will put it on the todo list/add it to the survey. However, it might take a little as there is a lot of other stuff to add first. Calendar charts went down sometime this morning ... is it just me, or is it a web site issue? @trader212 that is me, I am implementing some changes at the moment (normally I add a banner with some short info. Will do it next time again). How do we rescale y-axis after eliminating unwanted outliers that make the chart hard to read? How do we set a user-defined y-axis range, mostly for charts where the after-earnings action is so extreme that the pre-earnings part is hard to read? Remember that by clicking on a line's legend entry this line is simply hidden on the chart. The graph itself does not recaluclate, and the average for instance (mean or median) will still be displayed including this line. It is only when you select one or more cycles in the 'Exclude individual EAs' dropdown that the chart data reloads, including the 'corrected' avg. Perfect, thanks ... now I remember doing that before. @Christof+ Any chance that the decay rate could be recalculated after removing cycles in 'Exclude individuals EAs from graph'?